Published: January 3, 2011 | This entry was posted in North American New Right and tagged articles, commemorations, Greg Johnson, J. R. R. Tolkien, literature, North American New Right, originals, The Hobbit, The Lord of the Rings. Both comments and trackbacks are currently closed. I have been obsessively reading and rereading my favorite passages from the Tolkien for 20 years. 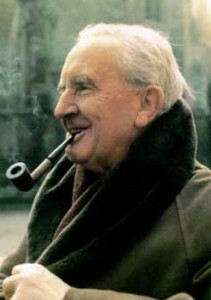 There are many themes in Tolkien of interest from a racialist perspective, including miscegenation, fratricidal wars, and the decline and loss of culture and tradition. The Numenoreans inbreed with the native stock of Middle Earth (miscegenation), Feanor leads an Elven “kin-slaying” (fratricide), and the decline of Arnor, Gondor and the other descendants of the Numenoreans in Middle Earth reflects the loss of tradition. Tolkien was very pessimistic. Decay, decline, and death are the greatest themes in his work. Doesn’t the example of Tolkien show that Christianity itself is not inimical to Tradition, as some on the Right believe? Rather, it is its political deformation. The churches are permeated by Leftism, but so are all the other institutions of this era. Or it simply proves that people are inconsistent in their beliefs. well, at least you saved me the trouble of saying it, Greg. Tolkien worked in the realm of chilvary as an ideal. Read Richard Weaver’s Southern Tradition at Bay for another exemplary take on the theme. White Nationalists would do well to steep themselves in the miseries of the South. We are all Southernerns now. Thanks for this. What a site this has become! Ernst Junger, Drieu La Rochelle, Tolkien–all in one morning, on one site. You are doing a good work. Keep it up! I am moved to contribute; Happy New Year! It’s a pity that Joseph Pearce is an apostate from White nationalism. He’s not a bad writer, but he’s no longer on our side. Incidentally, I notice that Troy Southgate’s book, Nazis, Fascists or Neither? The Ideological Credentials of the British Far Right, 1987-1994, has recently been published. I would have to say that of the leading figures of British nationalism of the era covered in the book, the only one I would regard as a revolutionary nationalist would be John Tyndall. Interesting about Pearce. I found this speech he gave on his conversion from zealous nationalist to Catholicism which was inspired by his reading of GK Chesterton while in solitary confinement. He’s a bad writer if he abandoned the Cause, especially if he went over to the other side. Writing well is no virtue unless it advances our Cause. Amen to that, WR. Tyndall was a giant among political pygmies. Get a copy of his Eleventh Hour: Call for British Rebirth , 1988, if you haven’t already. Five used copies (including one hardback) available at Amazon from $42-$50. Be sure to read the looong 5-star review there. While I’m not a Christian, I think that the parable of the talents is applicable here. It is delinquent and dishonourable not to use one’s talents properly, whether by failing to use them, or by using them for unworthy ends. However great or humble one’s talents may be, one has a responsibility to use them as wisely and beneficently as possible, for the good of one’s people. The greater one’s talents, the greater one’s responsibilities. Delinquency is one of the great evils of our time. What makes the defeats we have suffered as a people so shameful is that they have been quite unnecessary and avoidable. In Greek tragedy, men were condemned by the caprice of the gods, or the remorseless workings of fate. In the tragedy of our time, our people condemn themselves through “diseased will or sodden inertia” (Ezra Pound). Through persistent or wilful blindness, folly, stupidity, and cowardice, we refuse to take responsibility for ourselves as a people. We embolden our enemies through our ignominious conduct. We do not challenge even the most ridiculous and contemptible lies and delusions of Jews and their lackeys (e.g. that race does not exist). As William Gayley Simpson said of the Jewish holocaust story, our people swallow these things hook, line, and sinker, and never catch a glimpse of the grinning Jew at the end of the reel. We surrender more and more territory to swarms of “vile-visaged and deleterious forms of human rubbish” (Hinton Rowan Helper) that we would have swept aside in the past like chaff. Caligula’s appointment of a horse as a consul is often cited as an example of his insanity. White Americans have repeatedly outdone Caligula in this respect. They have repeatedly elected anthropoid vermin — such as Barack Obama, George W. Bush, and Bill Clinton — to the highest offices. They expect and demand nothing better than what they get. They don’t seem to think that the system is broken or that it should be changed. Of course, I’ve read John Tyndall’s The Eleventh Hour, and I think highly of it. New copies of the second edition are still available from Steven Books (http://www.stevenbooks.co.uk/). Yes, Tolkien was a devout Roman Catholic traditionalist, he also had a son who was a priest. His faith infused his work. His oeuvre is the proof that a Catholic traditionalist can use the talents God gave him in all domains.